An insider view of the wild ride that was the financial bonanza of New York's Wall Street in the last decade of the 21st Century. The financial narrative of a high roller in this market, the excess and hubris, the addictions, meteoric heights and predictable declines of a class of workaholics, hedonistic snake charmers. Sin, remorse, and redemption are fully displayed. Read the first paragraph -- can you resist? The audio narrator led me to this title, and the writing moved me to all titles by this author. 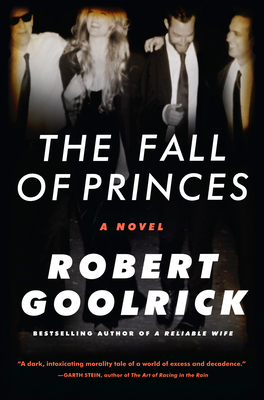 In The Fall of Princes, bestselling author Robert Goolrick brings to vivid life New York City in the 1980s, a world of excess and self-indulgence, where limousines waited for hours outside Manhattan’s newest trendy club or the latest dining hot spot. Where drugs were bountiful and not refused. Where no price was too high and flesh was always on offer. Where a quick trip to Europe or a weekend on the coast or a fabulous Hamptons beach house were just part of what was expected. When the money just kept coming, and coming, and coming . . . until it didn’t. This is the story of young men, princes all. Too much money. Too much freedom. They thought it would never end. Looking back on a Wall Street career that began with great success and ended with a precipitous crash, Rooney tells the story of how he and a group of other young turks made it to the top in the financial world and then, one by one, took a fall. For some, it was tragic; for others, it was the simple but bruising act of yielding to a life of mediocrity. For Rooney, however, it became a lifelong struggle to maintain a sense of dignity and to cling to the illusion of the life he once led. Stunning in its acute observations about great wealth and its absence, and deeply moving in its depiction of the ways in which these young men learn to cope with both extremes, The Fall of Princes takes readers on a journey that is both starkly revealing and dazzlingly entertaining, a true tour de force.